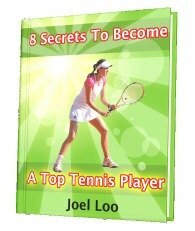 Just to update you of my latest article "Tennis Moonballer: 4 Secrets To Beat Them". This article came out because I saw a lot recreational players having problems with moonballers. You see, playing with these players requires certain amount of patience and strategies. If you play to their game, you will end up being frustrated or lose steam towards the end of the match. That is why I am sharing 4 simple tips to beat these players today. After reading the article, share with me if you find the tips useful or not. You can even share your results with me after trying to apply my tips in your game.